Thread: The truth about Solicitor William Gilmour is a matter of court record - he committed perjury. This post is only about Solicitor William Ross Gilmour and the below FACTS which are a matter of court record and two Law Society complaints in Toronto. This thread is not about why the other thread about Gilmour was locked nor by whom. FACT NO. 1: Gilmour committed perjury in Cuyahoga County Court in Ohio when he testified under oath that "I never had any written agreement with Mr. Gorcyca about my fees or anything else". Yet an hour later, he admitted under oath that this is his signature on a retainer agreement that directly jives with the sworn statements of witnesses Charles Arnold, Chris Stone, and Juan Pablo Sanchez (as well as Gorcyca and his wife). Now Gilmour refuses to talk about this agreement. FACT NO. 2. It is illegal for Canada to extradite an unindicted person who is not already criminally charged with a crime. For 9 months, Gilmour failed to advise the court that Gorcyca was not charged nor indicted for any crime. Likewise he failed to demand that the U.S. government produce "charging documents" another legal requirement of an extradition. He did this to "run the clock" and ask for more money. Had he pointed out these two point as verified by the below affidavit of attorney Wolkenstein, the case probably would have been dismissed from the outset. I am also a criminal lawyer and know what I am talking about. FACT NO. 4. Attormey Luis Konski submitted a 4 page fax received from Gilmour in which Gilmour says he will sell his clients confidential legal files for $50,000 to Konskli so his client Klaus Beiler can sue the U.S. government for farud. Konski can be reached for confirmation at 305-760-8500 and a scan of the actual fax can be found as one of 27 exhibits in this law society complaint (1 of 2) that you can read online at http://gilmourlawsocietycomplaint.wordpress.com. FACT NO. 5. Gilmour made contact with a CBS News reporter to obtain a supporting affidavit. That man's name was Ty West. West agreed to help but Gilmour who said he would send West a draft, did not so until AFTER the extradition was heard. At that point it was inadmissible and Gilmour made no effort to introduce it as fresh evidence. The dated affidavit from West is also an exhibit in the above law society complaint. FACT NO 6. Gilmour claimed he could not find a witness named Andy Kim who was getting threatening calls about testifying on behalf of Gorcyca yet Gilmour was given the man's home and office address where Kim lived and worked for five years and at the time of the hearings. Here are the ststements of Kim given to MP Paul Szabo of Mississauga at the time who requested a meeting with Gilmour but Gilmour claimed to be "too busy"! Imagine that, a member of Parliament offers to help your client with an official government investigation but you are "too busy"? FACT NO. 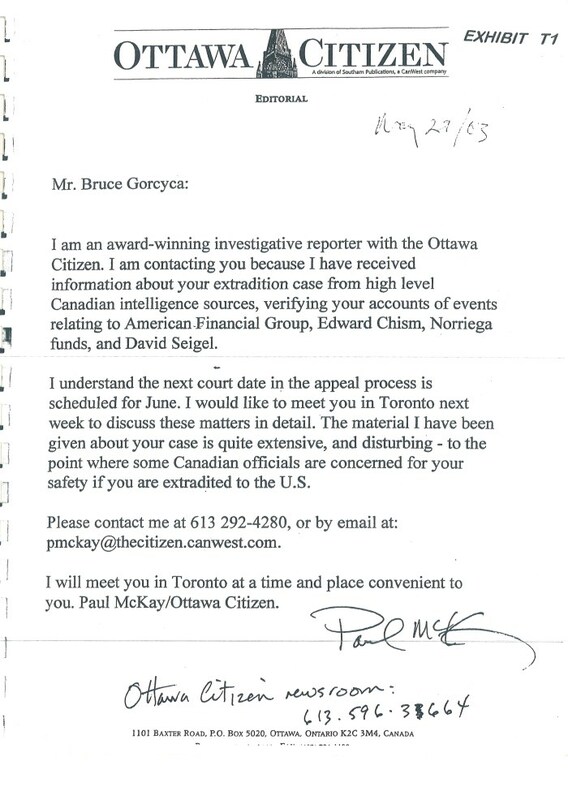 7 Gilmour arranged a meeting with the FBI and his client to work out a deal where Gorcyca could "cooperate" from the safety of Canada. But when one of the agents starts threatening his client he leaves the meeting so he would not be a witness. Being a witness would mean he would have to stop collecting fees as a lawyer and he would be recused. This occurred in January of 2001 at the Metro West Detention Center as per this document. FACT NO. 8 Gilmour filed a boiler plate appeal motion on the deadline date that actually contained prejudicial errors without ever showing the appeal to his client as he was instructed in writing to do. As a result Gorcyca was forced to inform the court and asked the motion to be thrown out. Other breaches of law and ethics can be found at http://bruceandthecourts.blogspot.ca. Also another Gilmour client named Vic Richards can be reached at (905) 270-8974 and can tell you how Gilmour tried to steal his business in the most unethical way possible. YES, all of the above are FACTS - not opinions, for anyone interested in the truth about a lawyer who was once asked to resign from the RCMP after a wrongful shooting incident of a young teeenage boy, which Gilmour himself does not deny. Below is the second page to the FBI Director only as a reference as to WHY Gilmour would sell out. Anyone can cut an paste government database material that do not show these details. Only people willing to read the court files at Osgoode Hall and the Law Society complaint will learn what is here, and this is only a fraction of the incompetence and deceit exhibited by Mr. Gilmour. Those who want even more credibility should read the 11 page investogative report of Canadian P.I. Ed Reiken found as an exhibit in the Law Society complaint and also here http://s53.photobucket.com/user/RR1975/slideshow/BAGD/#! Last edited by The Turk; 05-03-2016 at 12:22 AM. Re: The truth about Solicitor William Gilmour is a matter of court record - he committed perjury. can we merge these redundant threads? can we merge purge these redundant threads? one could argue that it still means 'merged'......but with the recycle bin.